A light wave is known to vibrate in multitude of directions. In general a light wave can be thought of as vibrating in horizontal and verticalplanes. Vertical component of light helps human eye to see where as horizontal component creates glare. Light reflecting off a horizontal shiny surface such as car windscreen , sand, water, snow, and asphalt roads. Glare reduces visibility, makes vision uncomfortable and painful. Polarised sunglasses are used to reduce glare. Sunglasses contain polarizing filters oriented vertically to the frames so that they block horizontally polarised light. 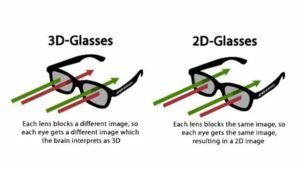 How are Polarised glasses made? Poly vinyl alcohol is heated and stretched to five times its natural length, making it even thinner. This lengthens PVA’s long chain molecules, causing them to align. The stretched PVA is then dipped in iodine solution. The iodine is absorbed into the molecular chains forming long grids of parallel, darkened lines that are not visible to the human eye. NuPolar’s have developed the technology of casting the polarized filter in and around its CR39 (or polycarbonate) host material. This means that you get an optically correct lens where the polarizing filter cannot be worn of scratched off. The plastic can be melted and poured into a mould in which the polarizing film has been suspended. The plastic then hardens around the film, creating a solid material, rather than a layered one. For polycarbonate lenses, the polarizing film is applied to the front of the lens and covered with a scratch-resistant coating. 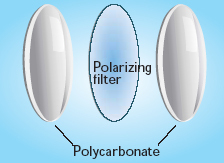 Polarisation depends upon the quality of the filter & how the lens is produced. Less expensive glasses may only cut out 10% of reflected light. Julbo’s polycarbonate polarized lenses cut out around 60 – 70% of reflected light. NXT Cameleon, Octopus and Polar HD lenses cut out 99% of reflected light. Depending upon the thickness of the filter, these are classified into two types. 1.1mm: Same effect of reducing glare, but thicker, expensive, high impact resistant. Polarised glasses improves visual comfort, contrast and visual clarity. It reduces eye strain. They are useful for bikers, joggers, boaters and fisher man to enjoy a clearer view along with elimination of glare. Polarised bifocal sunglasses or progressive lenses are options to presbyopes who likes outdoor sports. Allows true perception of colors. 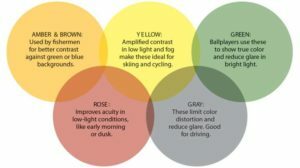 If the wearer tilts his head past 45 degrees or so, some of the horizontal light can enter and cause some bright spots. How to check for Polarised glasses? There are actually many ways for checking Polarised glasses. But one of the simplest ways is explained here. Many of the mobile screens, LCD s and tablets will have a polarising filter which helps to reduce reflections. 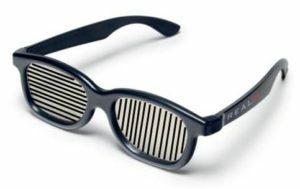 But when we use polaroid glasses at a particular orientation to the screen we wont be able to see the screen. He nce if we want to check for polarised gasses, take out your mobile and rotate the glasses. If it is a polarised, you wont be able to see the screen in a particular angle. If it unpolarised you can clearly see in all angles. What type of glasses are used for watching movies in 3D? Glasses used for waching 3D movies consists of one horizontally polarised glass and one vertically polarised glass. The image from each eye is fused and a 3D effect is perceived by the brain. ophthalmic lenses and dispensing by MO JALIE.